We host birthday parties that children remember. We have now added Sand art, Candle Making Canvas and Ceramic Painting. After Hours Adult Only Parties! Teddy Mountain hosts parties at our Weedsport or Fingerlakes Mall locations. 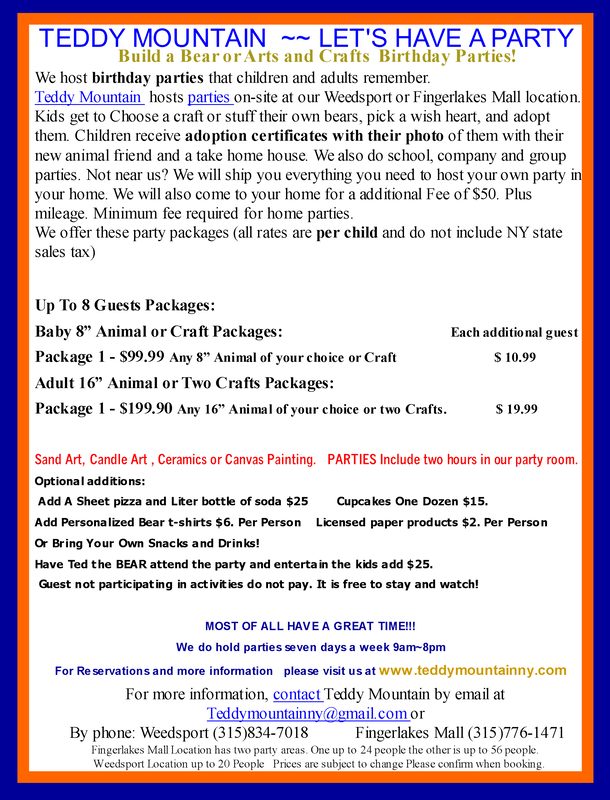 Guests get to choose to paint craft item, paint a canvas, make a sand art, candle art or stuff their own bears, and adopt them. Children receive adoption certificates with their picture, wish insert, take home house with their new animal. We also do schools, companies and groups. Celebrate your party in our FREE party room. You can Bring in your own Party Food and supplies Or purchase them below and we will have them ready for you. You can celebrate in our party room for free! You receive three hour for your party. We give you 30 minutes to set up, two hours for your party and thirty to finish up and pack your items. BE SURE TO MAKE YOUR $50 DEPOSIT. Deposit is applied to your party total. Deposit maybe made below with credit card or in store. Deposit will hold your date for you. If the date is unavailable and we cannot book a different date we will refund your deposit. Deposit is not refundable if you cancel or do not show up for your party.